I am playing along in the Papertrey Ink Challenge, Create Along With Us. I used a Spellbinders Fanciful Lattice die to create my card base, scored in half. Perfect for a note card size. Antique Linen and Calypso Coral inks. Sentiment stamped in Black Licorice Hybrid ink. I stamped off once for the flowers to give them a softer look. Papertrey Ink Daydreamer and Simple Sunflower stamp and die sets used. Frame was created by layering two Cross Stitched Rectangles by MFT. Simon Says Sunshine die. Iridescent sequins for accents. It's kind of a sweet little note card. Thanks for stopping by.....hope you have sunshine at your house! We do and I will be in the gardens all day soaking it up! How pretty! I love the lattice card base. It really adds a lot of interest. Your colors are beautiful as are your flowers. We have sunshine today too! Have a great day! Wait...Wow, You used a spellbinder die as a base? This is fantastic and you have out done yourself. Love the flowers that frame the border die. The sentiment inside the frame just "pops" ;pve the bit of shaded color there too. I love it all. Summery sweetness, Donna! Love the trellis die, and your layout is gorgeous! Beautiful take on Kay's card! Love the more neutral colours you've chosen, too. Gorgeous! Love your card base! I loved that card too. And I REALLY, REALLY love your take on it. The colors, the great scalloped shape, and how you used those flowers. Just gorgeous!!!! Your card is beautiful. I love the colors that you used. Wonderful take on Kay's card. Love your card base sooo clever. Like that you changed the ovals to rectangles and different shades of the sme colors Kay used. Just fabulous my crafty friend. Gorgeous card my dear. 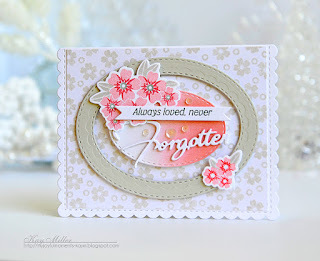 Love how you made the card base from the trellis die, very clever. Donna your card is stunning! I too, am loving the lattice card base and your Beautiful!! Beautiful, such a pretty lattice border for your card and I love the shading for the sunshine, those are some pretty flowers! Oh, Donna, this is GORGEOUS, and I love your interpretation of Kay's card (which I love as well). I just purchased this die that you've used for the base, so I am thrilled to see how you've used it! It's perfectly stunning with the frame you've added along with the flowers and sentiment! You are so clever and creative, my friend! Oh, what a delight! Big hugs!